It’s sobering to see our city used to epitomize poverty. However, by understanding the extent of the problem, we can better understand the need to find solutions. The Junior League of Tulsa (JLT) is committed to ending the cycle of poverty through hands-on education and community-based training. From our Impact committee’s done-in-a-day projects to our two committees partnering with the Resonance Center for Women, we have multiple projects confronting poverty head-on with our community partners. But there’s still more to do. Economic recovery and job creation in the United States has been on the upswing since the 2008 recession. However, even with Oklahoma boasting an unemployment rate below the national average, its citizens are suffering increasingly from food insecurity and homelessness. Oklahoma ranks worse than national numbers in overall poverty rates and child poverty rates, according to 2013 census data. Tulsa County’s profile matches that of the state as a whole, with 16.1% of the overall population living below the poverty line and 24.3% of children living in poverty. Our city’s numbers are even more sobering: the 2013 poverty rate in the city of Tulsa was 19.7%, meaning approximately one in five residents were living below the poverty line. We asked Sandra Lewis, executive director of Tulsa’s Day Center for the Homeless, why poverty in Tulsa is so prevalent and, more specifically, why people go homeless. According to the Bureau of Labor Statistics, Oklahoma has the nation’s third-highest rate of people working at or below the minimum wage. A single parent who works full-time at minimum wage and has one or more dependents would still be below the poverty line. The 2015 Department of Health and Human Services poverty line is $24,250 for a family of four, but research has indicated that families need a minimum of twice the federal poverty level to cover basic needs such as housing, food, and childcare. Even finding a job is difficult for Tulsa’s disadvantaged population. Many employers require online applications and a permanent address, and new job requirements such as appropriate clothing and bus fare are difficult to fulfill before the individual starts earning an income. Lewis indicates the lack of a robust and efficient transportation system in Tulsa poses a significant barrier to earning an income. She recalls a couple who began working at The Wild Fork, but who, due to their shift work, had to walk home from Utica Square to the Day Center for the Homeless downtown. A single female—who would have to make that trek alone—likely would not accept that job. So how to eradicate the cycle of poverty? Focusing on mothers and children is one key strategy. Low family income puts children at risk, and the risks start before birth. For example, pregnant women with health problems are in jeopardy of delivering babies with low birth weights, which in turn leads to infant mortality or health and developmental problems. 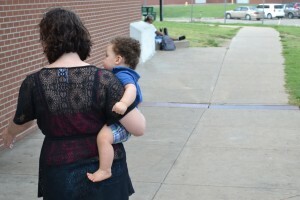 An increasing number of Oklahoman children—one in four—live in poverty, according to the 2014 edition of the KIDS COUNT Data Book, an annual publication compiled by the Annie E. Casey Foundation of Baltimore. According to CSC Tulsa, nine out of 10 Tulsa Public School students are eligible for and participate in free and reduced lunch programs. There are approximately 2,000 homeless students in TPS, and the number is rising. The number of homeless students in Oklahoma grew 43% from 2011 to 2013, and TPS has approximately 600 more homeless students than it did three years ago, as reported by Morgan Phillips in Tulsa People in August 2015. Children of female convicts also face a significant disadvantage and are prone to poverty. As Time Magazine reported in 2011, Oklahoma has a higher rate of female incarceration than any other state, almost double the national average. Three percent of Oklahoma children have at least one parent in prison, and children with at least one incarcerated parent are five times more likely to go to prison at some point in their lives. Poverty also impacts a child’s education. Hunger impedes his or her ability to learn at school, and he is less likely to be exposed to a rich language environment at school or have access to a high-quality preschool. In Tulsa, both the Community Action Project (CAP) and Educare administer the local Head Start programs and are nationally recognized. CAP Tulsa approaches the poverty problem via education and by looking at multigenerational poverty, focusing on “Promise Neighborhoods” such as Kendall-Whittier. These Promise Neighborhoods address the problem of so-called poverty belts—areas in which more than 40 percent of the population is below the federal poverty level. Breaking the cycle of poverty is even harder as concentrated areas of poverty grow both nationwide and in Tulsa. For example, here the ZIP codes with the highest rates of unemployment are primarily concentrated in north and west Tulsa. There are 24 poverty belts in Tulsa County, up from 9 in 2000. In areas of concentrated poverty, local residents find “the educational, health, and crime cards are stacked against them ever getting to a better station,” according to a 2014 report released by the Brookings Institution. JLT has two committees devoted to working with the women in the Resonance program. The Turley Residential Center committee teaches a curriculum focusing on developing social skills, learning healthy hobbies, and promoting self-esteem necessary for the women to successfully transition back into society. The Social Venture committee researches and develops a self-sustaining business as a means to provide job readiness skills and employment options for the women in the Resonance program. Our focus on children in the community includes partnerships to foster education and creativity through programs such as the After-School Homework Club at Tulsa City-County Library. Tulsa Library provides after-school tutoring for students in 3rd through 8th grades at 12 library locations throughout Tulsa County. As part of the program, JLT’s Homework Club committee members provide individual and small group tutoring assistance throughout the school year at several of the locations. JLT volunteers also teach bimonthly art classes to second graders at Hawthorne Elementary, a low-income public school in north Tulsa. Due to lack of funding, the students would not have the opportunity to participate in art classes otherwise. JLT members provide individual attention to the students using an art education curriculum we developed. The classes promote creativity, increase self-esteem, and allow the children to practice their fine motor skills. In addition, JLT is a community partner with the Westside Harvest Market, a nonprofit grocery store located in the low-income Eugene Field Elementary neighborhood of west Tulsa. Harvest Market addresses a key problem associated with poverty belts: “food deserts,” which are urban neighborhoods or rural towns without ready access to fresh, healthy, affordable food. The Market currently serves approximately 1,000 low-income families by providing convenient access to reasonably priced groceries and other necessities. 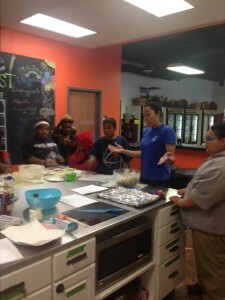 JLT volunteers conduct free cooking classes every month at the Market. We teach community children and their caregivers how to prepare healthy, budget-friendly meals using ingredients available at the neighborhood Market. We also provide basic nutrition education to community members who attend the classes. As expressed in JLT’s mission statement and core values, our presence in the community is the reason we have been in existence for 92 years. We seek to identify critical and emerging needs in the Tulsa community and determine ways our organization can serve those needs. To increase awareness about the impact of local poverty, JLT participates in an annual campaign: The Little Black Dress Initiative. Read more about how you can be a part of it here.